I was venturing my way around Melissa’s produce in Atlanta when somebody handed me a scorpion chili – one of the hottest chili. Have you tried it? Me neither and I’m not that adventurous to give it a try, though I took a small pack home. I grew up in South East Asia, which also means chili is a must for almost every dish. From veggies to poultry and to many more items on the table, chili is always a good companion in every meal. 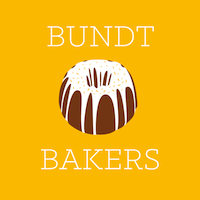 Well, it’s bundt cake time again! Luckily that scorpion chili has nothing to do with this bundt cake. This month is about hot chocolate. Have you had your hot chocolate yet? I love hot dark chocolate with marshmallow on top and I can keep on drinking that like no one else’s business. Anywho, this hot chocolate bundt cake deserves a special treatment. First because I use this heritage bundt cake pan. I love how simple and swirly the texture is and this is part of Nordic Ware amazing cast aluminum bundt bakeware collection. I like using this bundt cake pan because it creates a uniform baking and browning. Plus it ensures even heating and comes with a nonstick surface so it’s easy to release the cake and to clean-up the pan afterwards. And of course, since the holidays are here… and I try to skip glazing my cake, I decided to make it even more fun. Duo-tone bundt cake – to keep it simple and elegant. The chocolate has a spicy kick because that’s the hot chocolate habanero cake, while the vanilla gives a balance flavor to this. I am glad the husband was so impressed with the result and I’m doing my happy dance as we’re eating this. Hot chocolate cake: Warm the milk in a pan and pour over the semi-sweet chocolate. Set aside. In a bowl, combine the flour, baking powder, salt, ancho chili, cocoa powder, and habanero powder. Whisk the eggs, vanilla, sugar, and vegetable oil under low speed for 3 minutes. Add the chocolate mixture. Set aside. Vanilla cake: Combine all the ingredients and mix well. Using piping bags, alternate between hot chocolate cake and vanilla cake to fill in your bundt cake pan. Bake for 35 minutes. Let it cool and enjoy. I hear people raving about the combination of chocolate and spice but I have yet to try it. This beautiful cake looks like the perfect way to take the plunge! This is the pretties bundt cake I have ever seen! And that flavor combo – can’t wait to try it! Such a pretty bundt with the two colors and then the spice intrigues me. I have done this before with heat and chocolate and loved it. A pepper hotter than a habanero?? I have not heard of this either. Nor have I heard of a chocolate habanero cake but it certainly sounds wonderful. I love the swirls, such a pretty bundt and the flavours sound lovely too. What a gorgeous cake, Linda! I’m literally stunned at the duo-tone thing. I totally want to make this now…and I’m loving the spicy chocolate addition here. How exactly do you pipe the 2 colors into the pan? In horizontal layers or in vertical “strips”? I’m totally intrigued! habanero in a bundt cake? color me intrigued. good job on the piping; it’s absolutely beautiful! This is just about the most gorgeous use I have ever seen the Heritage pan put to! Wow! And I love those interspersing flavors! I love the colors of your bundt, it´s so original!! I love the alternating swirls. Lovely!